Erin Blegen: My Scrap Cabin: C'est Magnifique: My first September reveal!! I cannot believe that my newest baby niece is over 3 months old already and this is my first time scrapping her! 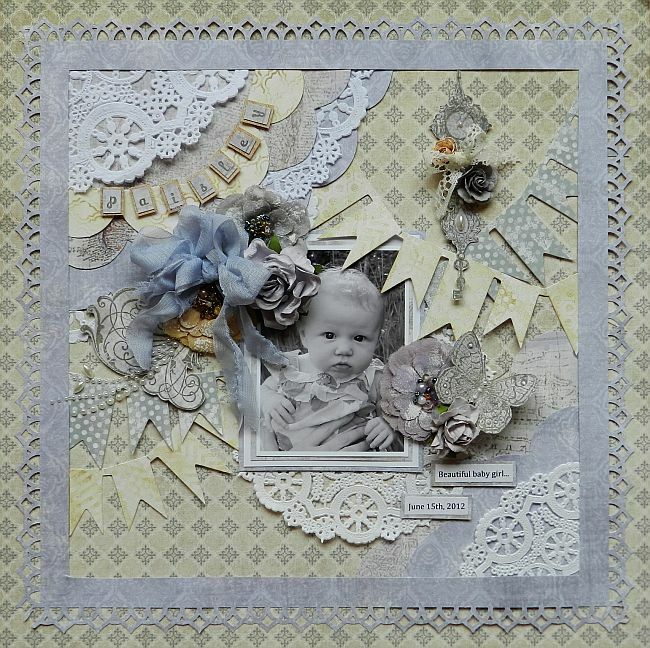 When I looked at the soft, pretty lavender shades in this kit, I knew it was the perfect match for a sweet little baby girl page. So here we are. I LOVE bows, and to create the beautiful bow in the upper left corner of my photo, I simply took one of the Manor House Creations rosettes, unraveled it so that I had a single strip of fabric, doubled it up and tied my bow- voila! Short and sweet tonight, Ladies (and gents :-/ )! Thanks for stopping on over and I hope you have a great night- I'm off to bed!! Just love this beautiful page~ What a doll she is! I love your creations! Such a beautiful layout. HI.. Oh how adorable this photo is and you have scrapped such a soft and pretty layout.. I love all the banners.. and the doilleys look wonderful... always love seeing your latest creation!! Wow! What a beautiful lo! The mix and design is amazing! Beautiful! Love the banners..so many great details, I'm going back for a third look. Gorgeous! Oh my gosh, Erin! This is gorgeous! I love the use of the doilies as well as that bow you created. How sweet to be able to see a little hatched chick, too! Thanks for stopping by my blog Erin. I love this page of Paisley especially the colours, its just beautiful. Beautiful. The layers and the mix of greys and blues is stunning. You really do weave some magic on your pages. this Lo is truly beautfiul!! love all the layers!! congrats again in all your successes! you are on a roll and I wish you all the best in the world! !